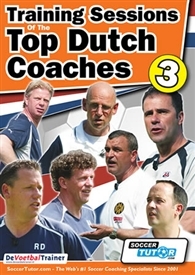 On volume 3 of this Video series there is over an hour of training sessions with Peter Bosz, Wiljan Vloet, John van Loen, Rob Druppers, Maarten Arts, Henk Mariman and Toine van de Goolberg who will show you how to coach players of all levels. Now you can use the same practices for your own sessions from the same Top Dutch Coaches that coached at; Feyenoord, PSV, NEC Nijmegen, FC Utrecht, Ajax, Sparta Rotterdam, and many more..
Age Group suitable for: from age 10+. SV Heusden, Dijka Steenwijk, JVC '31, Sparta '25, OJC Rosmalen, FC Den Bosch, Roda JC, Sparta Rotterdam, ADO Den Haag, PSV, NEC, Sparta Rotterdam (Technical Director). Conditioning coach at FC Utrecht, Personal Footballer Conditioning Coach. NEC, Fortuna Sittard, NAC and FC Utrecht, Saudi Arabia National Team. Sporting Lokeren (Academy Coach), Ajax and Germinal Beerschot (Head of Youth Development), Club Brugge KV (Technical Director). Exercise psychologist at many places including for the Dutch national team. Provides advice in the field of periodisation and football endurance training to numerous coaches at professional and amateur teams. Average Customer Review: 3.5 of 5 Total Reviews: 7 Write a review. Now have the full set of DVDs , and have found all of them to be very useful, especially coaching 2 touch football with pace. My players fav is the Gus Hiddink 3rd man running. Good service by Soccer Tutor! Video was good but expected a better quality picture! Anyway good to watch the experts in practice. There is no animated or written wiev of training sessions. It cud be more usefull is there cud be diagrams for example how to set up those sessions and directions of pass, running etc. Otherwice the quality is good and usefull i have purace some really low quality online dvd: s but every book and dvd;s from soccer tutor.com have been usefull and i recommede this sites to all coaches who want to develop their skilss. OK, not as good as previous 2 dvds, lots of fitness stuff on DVD but some good drills, not as valuable as others. professional trainers go about with a drill.